Just a days ago my long time friend Ben Boudreau (@yelphalifax / @Bboudreau) Tweeted me the best news I’ve been tweeted in a seriously long time, if not ever. Hanson. Is coming. To Halifax. When I moved to Nova Scotia in Grade 5 I recall a girl in my class with an orange CD that she’d bring to class. This was of course Hanson’s breakout album “Middle of Nowhere” that the smash hit “Mmmbop” came from. Then I remember hanging out at my older cousins that summer and they introduced me to the Much Music Countdown. Were they boys? Were they girls? Who cared. I was obsessed. After a hugely successful Christmas album called “Snowed In” Hanson fell off the radar and quickly reemerged with “This Time Around” in 2000. I digress. I obviously don’t need to regurgitate Hanson’s discography to you, but it is INCREDIBLY important to note that HANSON IS COMING TO HALIFAX. This is not only important because finally I will get to see these boys that I loved so very much as a teeny bopper, but I will be one degree of separation closer to Gossip Girl. WTF you say? Well, Hanson had a track in the season Premiere of Gossip Girl last year. If they’re relevant enough for Gossip Girl they’re relevant enough for me. So now begins my quest. Can I get Hanson to do a “Bee’s Knee’s” segment for This Needs to Stop? I’m sure as hell going to try my hardest. **Spoiler Alert! ** This episode of the RA discusses feminine hygiene products. That being said, I suggest you tune in to be sure you aren’t getting the wool pulled over your eyes by the female in your life who appears to have a particulary active…flow. You were warned. 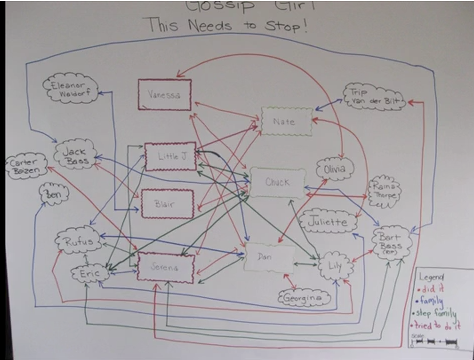 As if you didn’t already know the cast of Gossip Girl is extremely incestuous. Viewers of The Reacharound were having a tough time keeping up so to keep the viewers happy, we took some time out of our busy Saturday to sit down and plot out exactly what has gone down thus far. We also explore the confusing jargon surrounding the legal world, who is coming back to the show next week, and who will be the next one to add another complicated line to the flow chart.